Readers of this blog will know that I have long been an advocate of the recycling of plastic bottles, ever since I witnessed the Swedish scheme on a visit to Stockholm. Friends Ragnar and Carina are regular visitors to their supermarket, to return their empty plastic bottles and receive from the recycling bin at the rear of the store a krona refund. So easy, but us Brits are still throwing our plastic containers into landfill, into the sea or just into the hedgerows. I collect up local rubbish from my neighbourhood every week and 80% of the rubbish I pick up from the gutters and roadside are plastic bottles. 15 million bottles are thrown away every day in the UK. 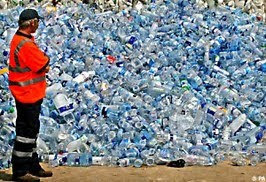 High street sales of bottled water continues to grow, so what of the future rubbish mountain? Some will say that the advent of reusable water bottles has helped reduce the problem, but what facilities are their for refilling them when you are out and about? When I was a boy, there were public water drinking fountains around the town, in the local parks and in the sports centres. These have all but gone now. That's why high street businesses are now under pressure to offer free tap water in the crackdown on plastic bottles. Licensed premises such as bars and restaurants are legally required to provide free drinking water on request, but few do, some refuse and some charge. Shouldn't we have a right to free tap water from any business selling food an drink on the go? 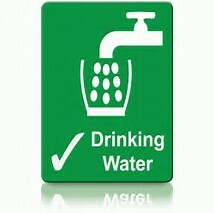 Recent research shows that 73% of Brits when asked, said they would like there to be greater access to free tap water. 60% said that firms serving food and drink should provide free water, regardless of whether someone is a customer or not. I agree! And the same proportion admitted that they would be more likely to carry a reusable bottle if free tap water was more freely available. Keep Britain Tidy compaigners are pressing this initiative convinced it would reduce the number of plastic bottles sent to landfill.